Should NgÅ©gÄ© wa Thiong’o have asked white people to leave his UCT public lecture? NgÅ©gÄ© wa Thiong’o is one of Africaâ€™s most influential and celebrated scholars of decolonialism. His series of public lectures taking place at universities around South Africa comes at a time when the topics of Afrocentrism, decolonialism, language, and the role of public institutions is of immediate concern to many – especially fallists. 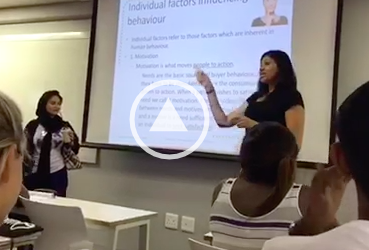 It is perhaps for this reason that a group of students at the University of Cape Town (UCT) felt inclined to orchestrate an intervention at his talk on the campus on Friday. UCT’s professor Xolela Mangcu took the stage immediately after the intervention and declined the request, saying that it would be disrespectful to wa Thiongâ€™o – whom Mangcu himself had invited to speak. 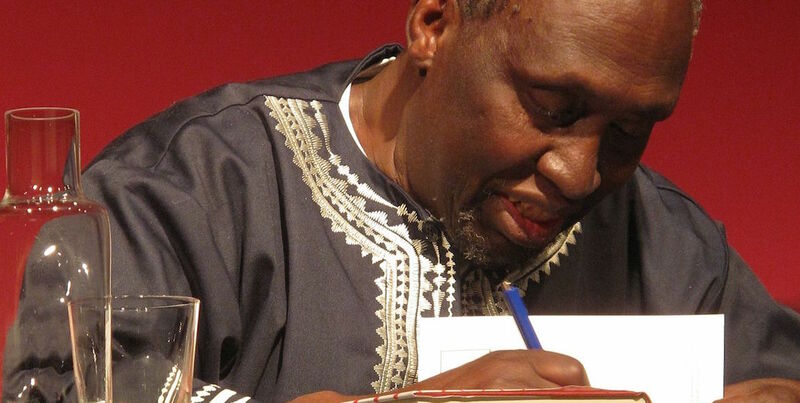 â€œIt would be the biggest shame to South Africa if Ngugi wa Thiongâ€™o did not get to speak about the issues that have been important to him all his life, simply because thereâ€™s a political statement that needs to be made,â€ said Mangcu. This is not the first time Mangcu shut down a request by students raising points of concern surrounding the presence of white people when talking about issues of particular concern to black people. Wa Thiongâ€™o responded with a personal story of his from Kenya – he told of a scenario where, when in the minority, they were able to build coalitions with other groups, including white people, to attempt to execute a plan, operating from the same ideological base. â€œThe key word here is the â€˜baseâ€™. From the base we can make contact, we can make alliances. Because not everybody thinks alike, not all of your peers are of one mind. And not all Africans, by virtue of being African, are for revolutionary change,â€ he said. Immediately after this Mangcu closed the meeting after a white member of the audience attempted to ask a question and was shouted down by many in the audience. Responses from students to the nightâ€™s events were somewhat mixed. 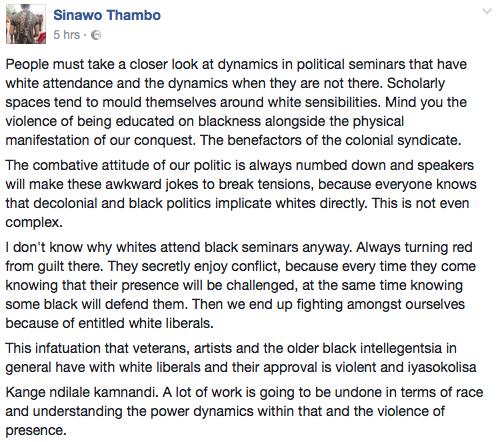 Some felt that wa Thiongâ€™oâ€™s response was simply a rendition of â€œnot all whitesâ€ and directly betrayed the teachings of Steve Biko. Others told The Daily Vox they believed the intervention was an open example of the â€œblack nationalist blocâ€ of UCT attempting to coup the space as a means of politicking, and that wa Thiongâ€™oâ€™s sentiments were fair. â€œI felt [wa Thiongâ€™oâ€™s] was a reasonable response and frankly it looked more like the intention of the intervention was about coup-ing the space for power. They were flexing their muscles and the mass in the audience was indifferent,â€ a student told The Daily Vox. Discussions of race, the politics of presence, representation and utilising popular events as platforms to push ideology, remain live in university spaces. If one thing is for sure, the days of quietly sitting by and listening to lectures without direct and outspoken involvement have long since past. The tone of engagement has shifted. Do we move with it or against it? So, those who supposedly call for more institutional inclusivity want their cause to be exclusive. George Orwell’s Animal Farm just repeats itself time and time again. Radical revolutionaries always turn on each other. One ‘exclusive’ regime just gets replaced by another. Shoulda coulda woulda. Fact is, he *didn’t*, because he’s an intellectual giant and not a vicious little hater like the entire “Fallist” movement and all your “woke” friends. I’m definetely understanding that White people might have to step back a bit (potentially asking questions last) when it comes to certain aspects of the fallist movement. How does someone knows which social ills I am concerned about? How someone can even predetermine which social ills I am concerned about? So someone needs to have experienced the discrimination to oppose against it? Am I not allowed to support anti-fascist movements because I have not been discriminated by fascists? I’m not allowed to support public transport when the past city development makes me drive a car? And usually, the argument is that White people cannot speak about the experience of Black people? But now some students can know what other people can be concerned about? The problem here is, when that the movement juggles so many critical issues that you just can’t handle it with breaking it down to race! If you do, you’ll achieve some aims, but others you won’t. So please take the extra effort of argument and a complex analysis and minimize racialized categorization to the instances where it is neccessary for the analysis.